Converted to single deck - National operation. Extended from Canning Town to Stratford via West Ham Station. Service diverted at Beckton via Asda. Re-routed between Newham Way and Stratford via Route 262 instead of Canning Town and Manor Way. Sunday introduced between Stratford and East Beckton. Converted to double deck operation as the need for single deck along Manor Way was transferred to new Route 276. Rerouted in Newham via Connaught Road instead of via Tollgate Road direct. Extended from Becontree Heath to Little Heath and a Sunday service re-introduced between East Beckton and Little Heath. Withdrawn between East Beckton and Stratford. Converted from double deck to midibus operation. 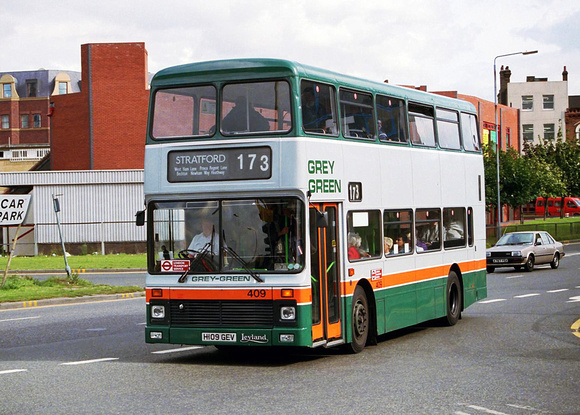 The Stratford to Greengate section replaced by new Route 473 Stratford and North Woolwich. Start of new contract and converted to low floor operation. VLA125 poses with the driver at Beckton Station. Occasionally a double decker replaces the usual Dart.